Over $200,000 was raised at the New England Zone’s touching Farewell Tribute honoring Nadav Tamir, Consul General of Israel to New England, and Colonel (Res.) Sharon Davidovich, JNF-KKL Israel Emissary. The evening included a cocktail reception, dinner and concert featuring Noa and Mira Awad, and Israeli-Arab duo known for promoting peace and understanding through music. JNF and guests paid tribute to Tamir and Davidovich for their extraordinary leadership and commitment to the land and people of Israel. Tamir has served as Consul General of Israel to New England since 2006 and is recognized as one of the most talented diplomats in the Foreign Ministry. 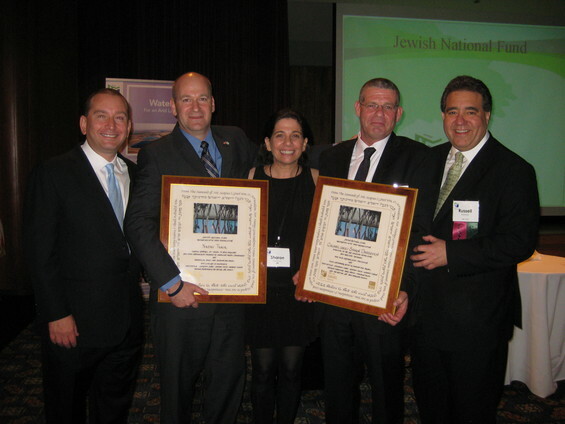 Davidovich served as New England Emissary since 2002 and is presently the National Director of the JNF-Parsons Water Fund which focuses on creating new water resources as well as preserving and improving existing ones. He has become a world-recognized expert on Israeli water issues. Speakers at the event included JNF CEO Russell Robinson, Regional President Robert Cohan and event chair & Vice President of Campaign Todd Patkin. Tribute videos for both honorees were created by Past President Ronald Lubin. Plaques were presented to both honorees by Zone President Larry Cohen and Chairman of the Board Jeffrey Davis. Yadira and Todd Patkin chaired the dinner. All funds raised support the JNF-Parsons Water Fund, a 10-year plan to create new water resources for Israel and her neighbors. JNF is currently building new reservoirs and sustainable wetlands at Ramon Air Force base, drilling near Kibbutz Shamir and harvesting rainwater from school rooftops. The goal is to increase Israel’s high-quality water supply by more than 440 billion gallons by 2020. To date, JNF has built more than 200 reservoirs, adding more than 66 billion gallons of water to Israel’s national water economy.